Cheeky Entertainment is the premier Burlesque Dance Show producer in Australia. The shows are a tribute to the divine art of Burlesque. Our spectacular show blends themes from “The Moulin Rouge of Paris” to the “Dazzling Energy of Las Vegas”. Our shows consist of amazing vocalists with a blend of comedy and exhilarating Burlesque Artists who perform production routines from “Burlesque” the movie, featuring Cher and Christina Aguilera, “Chicago the Movie” Razzle Dazzle, All that Jazz, the vintage pieces from Moulin Rouge “The Can Can”, “Lady Marmalade” and “Easy Virtue”, plus much more. 1. Have successfully performed over 100 shows world wide. 2. World class Burlesque dancers with breathtaking performances. 3. Have the best performers in the industry. 4. Provide the best variety on one stage at the one time. 5. Feature acts not performed by a lot of other shows. 6. We can tailor make a show suitable for your venue or themed event. 7. Beautifully Costumed – tributing to the divine art of Burlesque. 8. Suitable for all ages. 9. Fully choreographed routines, supporting Burlesque Artists. 10. Music from the past to the present. 11. Truly glamorous, and upmarket. 12. No two shows are the same, we add variety and blend our artists and show content to suit our clients or venue. 13. Multi Ace and Mo Award Winning performers. 14. This show is like no other it is original and truly sophisticated & glamourous. 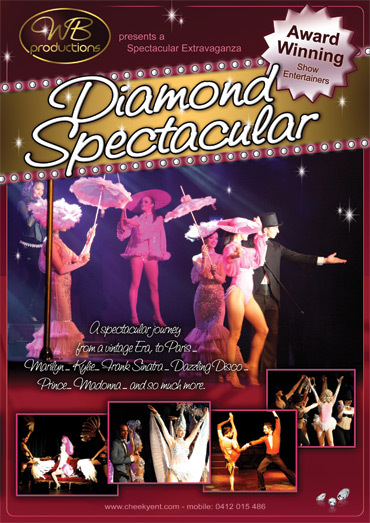 This show is not to be missed… it is “Absolutely the No.1 Best Burlesque Show in Australia”.